is 30-Years Old: The Consumer Federation of America (CFA) says California’s Proposition 103 — the insurance reform law — has saved consumers and California’s drivers $154 billion. Since 1989 — the Consumer Watchdog says — auto liability premiums have dropped by 5.7%. Liability premiums — however — have risen in the state and around the nation by 58.5%. The statement comes on upcoming 30th anniversary of the bill’s passage. “$154 billion is a 30th birthday gift from Prop 103 to the people of California, rewarding a battle against insurance company overcharges and abuses that has been waged every day for the last three decades,” Rosenfield noted. Six legislators have joined in a bipartisan effort to support a bill to allow first responders to get workers’ compensation coverage for psychological injuries. Senate Majority Leader and Boise Republican Chuck Winder agrees and supports the bill. Nevada’s work comp program Employers Holdings, Inc. posted third quarter earnings of $47.6 million. The profits hit $1.43 per share and after adjustments ended up at 98-cents per share. Revenue was $228.9 million. Shares have declined — however — by almost 10% since the start of 2018. Adopt definitions of: anesthesia conversion factor; base units; base rate; CMS; CPT; CPI adjustment; director; geographic rating area; modifier adjustment; out-of-network reimbursement; physical status units; Q modifier adjustment; and time units. ORS 743B.287, as amended by Senate Bill 1549 (2018), requires an insurer offering a health benefit plan and a health care service contractor to reimburse an out-of-network provider for emergency services or other covered inpatient or outpatient services provided at an in-network health care facility. The statute directs the Department of Consumer and Business Services (DCBS) to promulgate rules for calculating reimbursement rates. The statute requires that reimbursement be equal to the median allowed amount paid to in-network health care providers by commercial insurers in this state, based on data collected under ORS 442.466 for the 2015 calendar year, adjusted annually using the U.S. City Average Consumer Price Index for All Urban Consumers (All Items) (CPI-U) as published by the Bureau of Labor Statistics of the United States Department of Labor. It allows reimbursement to be adjusted based on the differences in allowed amounts paid to health care providers in certain geographic areas of this state. Public hearing: November 27, 2018 1:30 p.m.
Last day for public comment: December 4, 2018, 5 p.m.
An upcoming change in federal rules will make it more convenient for commercial driver license holders who use insulin to control diabetes to meet medical requirements. CDL holders who pass their medical examination after Nov. 19, 2018, will no longer need a federal exemption or state waiver. Instead, they will use a glucometer device that measures their blood sugar level daily and stores the results for the medical provider who manages their diabetes. Each driver’s current waiver or exemption will remain valid until its expiration date, but after Nov. 19 CDL holders can switch anytime to the new process by getting a new medical examiner’s certificate. A copy of the new medical certificate still must be filed with DMV anytime one is issued. Once a CDL holder with a waiver or exemption gets a new medical certificate under the new rules, it is important for the driver to inform DMV when filing their new certificate. Email a photo of the new certificate with “Waiver Clerk” in the subject line, name and license number to dsmec@odot.state.or.us. Mail a copy to: DMV – DSU Waiver Clerk, 1905 Lana Ave. NE, Salem OR 97314. The driver’s medical provider who manages their diabetes will need 90 days of test results to complete the assessment. CDL holders are encouraged to start working with their medical provider before their current waiver expires because of the 90-day period. A 90-day medical examination certificate may be issued if the driver is unable to start the new method in time to provide 90 days of test results and otherwise meets CDL medical requirements. A CDL holder who uses insulin for diabetes can then accumulate the needed test results to qualify for the one-year certificate. Drivers who wish to change their driving type to non-excepted interstate after they get a new medical examination certificate can do so by visiting their local DMV office. Amends for the purpose of prescribing: (1) the required financial statement forms, with instructions, to be filed annually by insurers; (2) the required financial statement forms, with instructions, to be filed quarterly by insurers; and (3) the required annual statement supplements, with instructions, to be filed by insurers, for the 2018 annual and 2019 quarterly reporting years. ORS 731.574 requires insurers to file annual financial statements with the Director of the Department of Consumer and Business Services, and authorizes the Director to prescribe use of the annual statement blank and instructions prepared by the National Association of Insurance Commissioners (NAIC) for such purpose. The Director has chosen to exercise such authority through rulemaking, and has routinely updated the rule to reflect the then current blanks and instructions. Commencing with the 2018 reporting year, the Director added a NAIC quarterly statement blank requirement to the rule in response to a concern that it did not clearly express such filing expectation. Inclusion of the quarterly statement blank requirement provides guidance to insurers, and is consistent with accreditation standards established by the NAIC. Public hearing: November 27, 2018 9:00 a.m.
We have released the proposed rule language on (R 2018-11). The Commissioner is considering adopting rules for property insurers, except commercial, to provide goods and/or services to their insureds in order to mitigate or prevent losses. When: November 27, 2018 at 12:00 p.m. Comments on the proposed rule language are due November 26, 2018; please send them to rulescoordinator@oic.wa.gov. We released a stakeholder draft for the Adverse notifications rule (R 2018-09). The purpose of this rulemaking is to increase consumer awareness of agency help for consumers with their insurance-related questions. It also promotes fair and efficient regulation of insurance by requiring contact information for the Office of the Insurance Commissioner on adverse notifications sent by insurers. When: November 8, 2018 at 3:00 p.m. Comments on the stakeholder draft are due November 9, 2018; please send them to rulescoordinator@oic.wa.gov. We are starting the proposed rulemaking (R2018-14) to update and clarify accounting requirements for the definition of unrestricted net assets for charities that issue charitable gift annuities. We are starting the proposed rulemaking (R2018-14) to create new and amend some existing sections of WAC 284-17-123 to clarify the special education condition found in RCW 48.17.380(3)(d) for an adjuster license candidate. The federal government recently adopted a rule related to short-term limited duration insurance. The federal rule would substantially expand the allowable duration of this type of insurance. In response to the federal rule, the Insurance Commissioner has clarified the standards and process for the filing of short-term limited duration medical plans sold to Washington consumers. The Insurance Commissioner’s rules set the maximum duration of short-term limited duration medical plans at three months, establish minimum standards for these plans and include consumer disclosure requirements. It happens to all of us. We age and suddenly it’s long term care time and we don’t have long term care solutions prepared. A survey from the insurer OneAmerica says the number of us not prepared is shocking. The survey checked in with 2,000 adults and found 38% of those 65 and over haven’t even talked about preparing for long term care much less prepared for the possibility. We haven’t talked with anyone, not a spouse or partner, other family members, friends, healthcare professionals, a financial planner, an insurance agent, an attorney, member of the clergy or an accountant. The other 62% surveyed — fortunately — did have that conversation. The Department of Health and Human Services (HHS) said 70% of us 65 and over will — at some point — need that long term care. For 20% of us — says OneAmerica’s VP of sales Tracey Edgar — that long term care will be for longer than five-years. “Regardless of income, it’s important to have conversations about the possibility of long-term care. Asset-based LTC protection is a solution that may be more within reach than people realize, especially if they’re nearing retirement and have assets to reposition. And everyone can benefit from understanding each other’s wishes and expectations for care,” Edgar said. The point? Regardless of age or income having the long term care conversation is important. If you haven’t done it, do it now. Or soon. The sharing economy is growing. Employed in this economy are people working as contractors for firms like Uber, Airbnb, Task Rabbit and others. Statistics gathered by the data gathering firm Statista says by 2021 some 86.5 million people will be participating in the sharing economy. That’s a 23% jump from today. He makes his point by noting that an Uber driver can drive anywhere and be covered by their personal auto insurance policy. Once they answer the call and go to pick up a fare, that insurance no longer covers them. This is why agents who understand those nuances will do very well in the gig economy — an economy desperate for proper insurance. “This gig economy has created the ability for more people to pick up ad-hoc, part-time jobs. The amount of people that insurers, agents and brokers can now sell additional coverage to has exploded,” he said. Medicare Workshop: A free Medicare Workshop for individuals turning 65 and those approaching Medicare eligibility will be held Wednesday, September 19, from 5:00 p.m. to 6:30 p.m. at the Hailey Public Library, located at 7 West Croy St., Hailey, Idaho. Caregivers and all those interested in learning how Medicare works are encouraged to attend. Kreidler Issues Fines: Insurance Commissioner Mike Kreidler issued fines in July totaling $115,050 against insurance companies, agents and brokers who violated state insurance regulations. A.M. Best is pretty happy with 2018. Results have improved thanks to lower catastrophe losses and growth in premiums. Or so says Best’s First Look: First Half 2018 Property Casualty Financial Results. All of the above along with very strong underwriting improvement pushed net income to $33.6 billion. That’s a 125.4% increase over the 2017 results for the first six-months of the year. As for rates, according to the Council of Insurance Agents & Brokers’ (CIAB) Commercial Property/Casualty Market Index Survey commercial premiums rose an average of 1.5% in the second quarter. He said 77% of the firms the CIAB connects with say the demand for cyber insurance is high. ISO and the Property Casualty Insurers Association of America (PCI) said insurers had a bad year in 2016. Net underwriting losses hit $4.7 billion. Unusually higher catastrophe losses are one reason why. Direct insured property losses were $21.6 billion in 2016 compared to $15.2 billion in 2015. That figure is also a couple of billion above the $19.2 billion average direct catastrophe losses in the last decade. The new report highlights why the $4.7 billion is so dramatic and compared the $4.7 billion to a gain of $8.9 billion in 2015. Private U.S. property/casualty insurers lost big in 2016, reporting a $4.7 billion net underwriting loss driven, in part, by significantly higher catastrophe-related property losses, according to ISO and the Property Casualty Insurers Association of America. The results stand in sharp contrast to the $8.9 billion net underwriting gain insurers reported for 2015. That was also a 25% cut in after-tax net income. That figure is $42.6 billion down from $56.8 billion. The combined ratio fell to 100.7 in 2016 from the 97.8 figure of 2015. ISO President Beth Fitzgerald put it in perspective. “Catastrophe losses continued to hurt insurer performance in 2016. There were 43 catastrophe events in 2016, the highest number of such events since 1980,” she said. • Net investment income for 2016 is $46.3 billion and compares to $47.2 billion in 2015. • Commercial lines direct premiums in 2016 rose 3.1% to $258.6 billion. • The growth is from small commercial and middle market risks including specialty trade contractors, building construction, real estate and auto dealers. • Industry surplus in 2016 is $700.9 billion industry surplus compared to $674.2 billion at the end of 2015. What’s Happening at Berkshire Hathaway — Underwriting Losses? For eons billionaire Warren Buffett’s Berkshire Hathaway has enjoyed underwriting profits. So it shocked the insurance world a couple of weeks ago when Berkshire Hathaway reported a pre-tax underwriting loss of $379 million. GEICO and BH Primary Group did well and saw underwriting profits but the BH Reinsurance Group and General Re had huge losses. A big part of the losses is increased loss estimates that related to the year before and the $10 billion reinsurance deal with AIG. Buffett agrees. “We’ll do well by getting $10.2 billion today, with a maximum payout of $20 billion between now and Judgment Day. The question is how fast we pay out the money,” Buffett said. In his annual address to Berkshire Hathaway shareholders, Buffett couldn’t resist a political potshot at the Republican effort to repeal ObamaCare. While admitting that healthcare costs are eating at the U.S. economy like a “tapeworm,” he also said what the Republicans are doing isn’t all that helpful either. He calls the American Health Care Act a tax cut for the rich and said under this plan his personal federal income taxes will drop 17%. “So it is a huge tax cut for guys like me. And when there’s a tax cut, either the deficit goes up or they get the taxes from somebody else,” Buffett said. While Congress and the Trump administration really haven’t helped health insurers when it comes to what’s going to happen with the Affordable Care Act, it is reaching out to small business and is trying to ease their health insurance burdens. 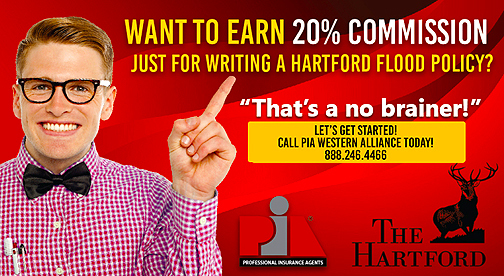 This is not only a big plus for small business, it could be a perk for the independent insurance agents of the PIA Western Alliance that sell health insurance. Rule changes will go into effect starting January 1st next year that will allow small business to go around the marketplaces of the Affordable Care Act's Small Business Health Options Program (SHOP) and purchase insurance directly from an insurance agent. The reason? SHOP hasn’t been very successful. Selema Verma is the administrator of the Centers for Medicare and Medicaid (CMS). She said SHOP was expected to insurance millions but in reality has covered just 85,000 people from 11,000 small businesses. “Our goal is to reduce ACA burdens on consumers and small businesses and make it easier for them to purchase coverage. The ACA has failed to provide affordable insurance to small business and to the American people. This new direction will help employers find affordable healthcare coverage for their employees and make the SHOP exchanges function more effectively,” she said. Businesses will still have to go through HealthCare.gov to determine eligibility. However, insurers will be able to use their own enrollment systems going forth. As for health insurers, Aetna said last week that it’s pulling out of the last of the ObamaCare exchanges. All that remains is Delaware and Nebraska. Financial losses and worries over more of them are the reason Aetna — and others — pulled out. Aetna isn’t alone. Insurers — says Kaiser Family Foundation health expert Cynthia Cox — are completely in the dark as to what the Trump administration and Congress are going to do with the Affordable Care Act. The indecision could lead to double-digit rate hikes in 2018 and some insurers — she noted — are already talking jumps of 50% or more. “It’s a significant factor in pricing this year. I think it’s fair to say these rates are higher than we would have expected to see in the absence of uncertainty,” she said. Meanwhile, the administration — via the Department of Health and Human Services (HHS) — is doing all it can to keep insurers in the market but Cox says that may not be enough. “Insurers don’t really know which to believe. They don’t know whether to believe the signs Congress and the administration will work to stabilize the market in the short term or to believe the signs they will work to destroy the market,” she said. California Insurance Commissioner Dave Jones is so unsure of what’s happening that he has asked insurers working in his state to submit two sets of rates for next year. One will be rates that assume ObamaCare will continue and the second is rates that assume TrumpCare will pass. The Center for Responsive Politics did an analysis of who gave what to the political candidates for last November’s presidential election. Overall — the center said — the candidates raised $1.5 billion for their campaigns. Outside groups working on behalf of individual candidates picked up another $615 million. Overall, the amount was well over $2 billion. Insurers and insurance associations and groups representing insurance have political favorites just like the individuals who inhabit the country. Their contributions totaled $23.5 million and that money was given to 25 different presidential candidates. Republican Jeb Bush picked up the most money from insurers. The $11.8 million didn’t help much. And it comes with an asterisk. A whopping $10 million of the $11.8 million came from Hank Greenberg’s C.V. Starr company which gave $15 million to candidates overall. Sen. Marco Rubio took second with $5.7 million and Hillary Clinton is third at $2.5 million. President Trump picked up $726,000. That — believe it or not — was good enough for 4th. The dollars given in 2016 were significantly higher than those put out by insurers during the 2012 presidential election. It totaled $7.4 million and of that Mitt Romney got $4.7 million and Barack Obama received $1.7 million.